Dubai: Consider this. In athletics, it is said that if you have a right muscle power to weight ratio then you’d be able to run faster than others. It was proved when Usain Bolt used this science to become the fastest man on the planet. Perhaps the same can be said of North America, trainer Satish Seemar’s big (literally) Dubai World Cup (Group 1) hope, who is a horse of outstanding ability, power and energy. He’s such a bigstriding horse. People don’t ealise how fast he is really going, because he looks like he’s halfpacing it while he’s actually moving along quickly. The ultimate equine athlete, he has won three of his last four races and seven overall, ever since he was astutely purchased from a Racing In Dubai Sale in 2017 by Chechen President Ramzan Kadyrov. Three days from now he will bid to scale the summit and win a race that both Seemar and Mullen have been dreaming about for a long time. The dream began last season but North America would miss the break at the start of the 2,000-metre contest on the Meydan dirt and run a troubled race to finish at the back of the field, way behind the winner Thunder Snow. He’s a proper Dubai product. He’s a very impressive horse. But a horse like him is always a challenge he’s not easy to train. But when he’s right, he’s right. This year the scenario is no different and North America, Seemar and Mullen will be seeking redemption to prove that he is one of the best dirt horses in the world. Seemar explains: “We figured out what went wrong that night. We used earplugs on him and took it off before the start of the race. They have powerful loudspeakers at Meydan and once the plugs had been removed the horse got nervous and that’s compromised his chances. Seemar also revealed that he will be employing the service of a handler at the gate to take care of any problems. “He won his maiden here,” said Seemar. “He’s a very impressive horse. North America was right on song when winning the first two rounds of the Al Maktoum Challenge, a prep series that builds to the Dubai World Cup. 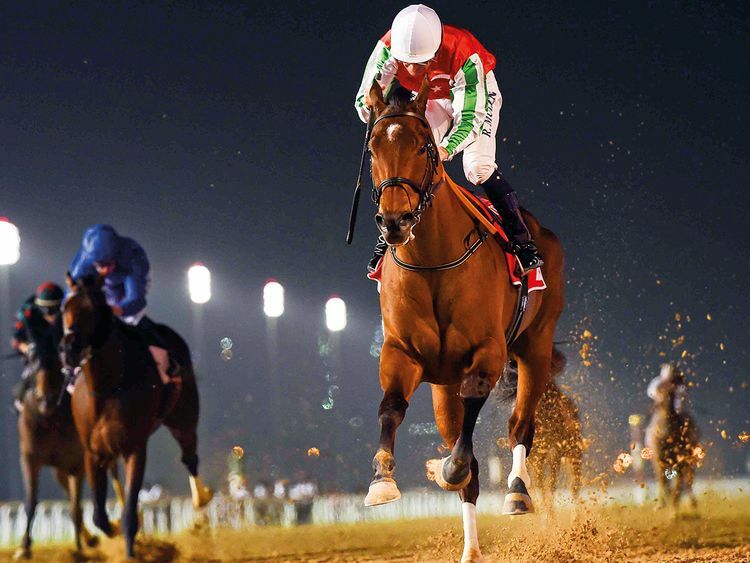 “Everybody knows he runs well when fresh, so we are banking on that,” said Seemar, who believes that this year’s renewal of the Dubai World Cup is a very open race. “If you really think about it, there are no hot favourites in the race. Horses like Gunnevera, Yoshida and Seeking The Soul, they are nice horses, but not superstars. Mullen, who said that he was really looking forward to riding North America in Saturday’s showpiece, explained the aura around the awesome galloper. “He’s such a big-striding horse,” he said, “People don’t really realise how fast he is really going, because he looks like he’s half-pacing it while he’s actually moving along quickly.